You’re invited to the Dental Expo at Metropolitan Family Services (222 E. Willow Ave in Wheaton) on July 18th from 9 to 2 pm. 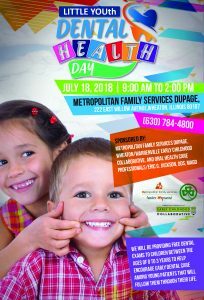 Please note that this event is intended for children ages 0-3 as it is focused on preventative dental care and easing the fear and expectations for children and parents that often comes with the first dental visit. The Oral Healthcare Professionals, specifically Dr. Eric Jackson, will be providing dental screenings and individualized dental education for families. Thank you, Dr. Jackson! We will also have special giveaway items for every family in attendance which include an event tote bag, dental board book, cup, age-appropriate toothbrush and more! !